Convicted criminal Derek Devoy escaped without injury yesterday, but his sister and an associate of his were both killed. 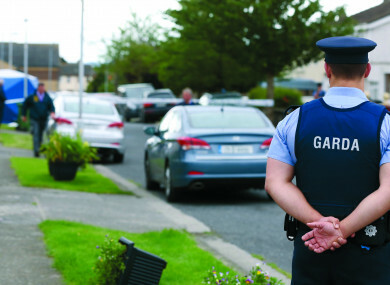 THE INTENDED TARGET of a shooting in Ballymun, north Dublin, yesterday afternoon had been warned by gardaí of the threat to his life months beforehand. Two people were killed and another two were injured when a gunman opened fire outside a house on Balbutcher Road. One of the victims, Antoinette Corbally (40s), a mother of six, was the sister of convicted criminal Derek Devoy, who gardaí believe was the intended target of this hit. Corbally was fatally wounded as she stood at the doorway of the Ballymun house talking to her boyfriend, who sustained a gunshot wound to the leg in the incident, but was not critically injured. Also killed was an associate of Devoy’s, a man in his 30s, who had driven him to the house and was waiting in a car outside. Antoinette Corbally’s 18-year-old daughter also suffered minor injuries in the incident, though it is understood she was not shot. It is believed the gunman followed Devoy and had planned to ambush him outside the house, but he ran into the property and escaped injury. Devoy was released from prison in 2015 after serving time for shooting at his neighbours and for an attempted post office robbery in Balbriggan, north Dublin. TheJournal.ie understands gardaí had warned him of the threat to his life around three months ago. The Armed Response Unit has also been carrying out checkpoints in the area because of this threat. A source told TheJournal.ie that Devoy had recently angered the same north Dublin gang suspected of murdering his brother ‘Mad’ Mickey in January 2014. Mickey Devoy was shot dead the day after his release from Portlaoise prison. He had attempted to kill convicted drug dealer Greg Lynch the previous year. He shot Lynch in the face at close range outside a bar on Hanlon’s Corner in north Dublin, but the drug boss survived the attack. Mickey Devoy murder was believed to have been in retaliation for this attempted hit. Speaking to TheJournal.ie about the incident, local Fine Gael TD Noel Rock said it was “the worst thing to happen in Ballymun in many years”. “My sympathies are with the deceased and my thoughts are with the injured. I hope that gardaí are successful in their enquiries, assisted by the community where necessary and that order is restored and justice is done,” he said. It is frustrating to see this happening in Ballymun when we all know that the community is much more than this kind of bad news. I want to appeal to the community for any information they may have in respect of this crime. We’re particularly interested in people who may beenin Balbutcher Drive today around 4 o’clock or even during the course of the day. We’re also appealing to people who may have dash cams, maybe delivery drivers, taxi drivers – that footage may be of some use. Wheatley also confirmed that a firearm had been recovered “in the vicinity” and is currently being analysed. A silver Opel Zafira with number plates of 08 LS was found partially burnt out a short distance from the scene at Balbutcher Drive. Gardaí also found a second car – a Golf GTi with number plates 06-LH-3466 – at Santry Close, which they believe is linked to the incident. Post-mortem examinations are expected to take place later today. Anyone with information can contact Ballymun Garda Station on 01 666 4400 or the Garda Confidential Line 1800 666 111. Email “Intended target of Ballymun shooting had been warned of threat to his life”. Feedback on “Intended target of Ballymun shooting had been warned of threat to his life”.